A young reporter on assignment learns the history of a town’s black community. After graduating from college in California, Louis Guerin has returned to his Louisiana hometown to work as a reporter for the Bayonne Journal, the weekly newspaper. As the story opens, a man named Brady Sims shoots his own son, who has just been convicted of two crimes, in front of the judge, jury, and courthouse bystanders, including Louis, who's covering the case. 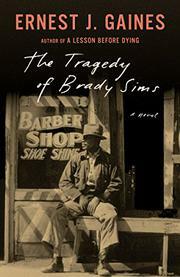 Assigned to write "a human interest story" on Brady, Louis spends a day at the town barbershop and learns that his subject was the disciplinarian for the quarter, the town’s black section, whipping children (mostly boys) who erred in an effort to keep them from the worse fate of ending up in Angola, the infamous state prison. As the barbers, customers, and shop loiterers talk, they offer a fuller and occasionally sympathetic picture of Brady while simultaneously showing how World War II, technology, and the Great Migration caused strife for those living in the quarter. Those larger themes, though central to the story, are expressed perhaps at the expense of a deeper portrayal of Brady. Though Mapes, the town sheriff and one of Brady's only friends, attempts to provide nuance to the character of a reputedly violent man, his testimony does not quite help generate adequate sympathy for Brady. In his first novel in more than 20 years, National Book Critics Circle Award winner Gaines (Mozart and Leadbelly: Stories and Essays, 2005, etc.) returns to the themes (crime, punishment, and compassion) and milieu (the rural South) for which he is best known, telling a simple yet provocative tale that reverberates from its Southern core, with a keen ear for the way men talk when they are among each other. Though readers may come to understand Brady’s motivations for killing his son in this expertly rendered story, they may do so with varying levels of sympathy for him. Gaines competently reveals his central character's motivations, but that might not be enough to make readers care about the man's fate.